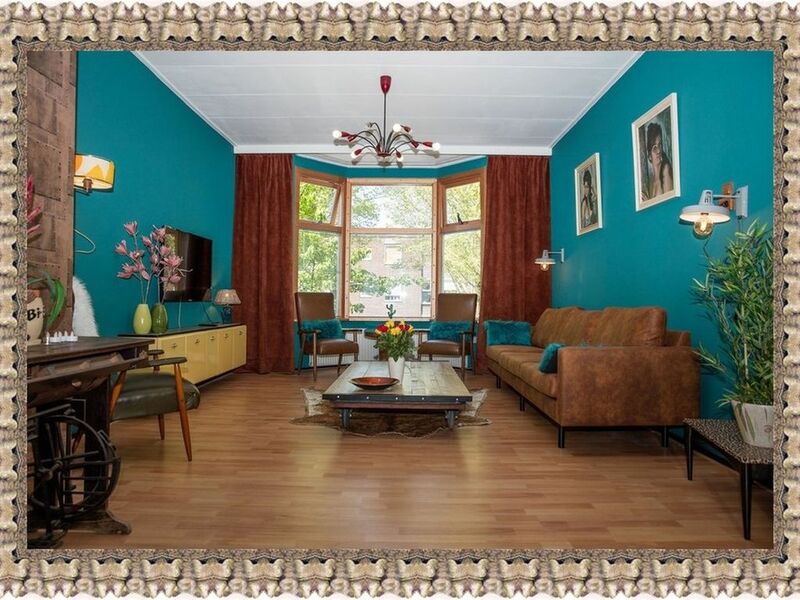 Hello Spring!Unique and Large Retro / Industrial Apartment in Vlissingen. Come and enjoy in Vlissingen! A city that really has everything. A center, museums, sea, beach but Vlissingen even has its own forest, the Nollebos is right next to the beach. A unique place where you can look from the restaurants and terraces on the boulevard to the other side, but where the ships sail past you. We will spend a few days there. Even in autumn and winter this apartment offers a comfortable living space to stay comfortably. located on the 1st and 2nd floor of a stately home from 1930. With a living room of a huge 40m2, with vintage and industrial interior, carefully and tastefully decorated. Complete with a 50 "smart TV for a cinema effect at home to watch netflix and internet or rent a video. The 3 modernized bedrooms have comfortable box spring beds, 1 bedroom with balcony. Modern bathroom with double sink, lovely shower and toilet. The large atmospheric illuminated balcony where you sit in the evening with a nice drink to eat at the spacious dining area or in the lounge set after talking about the holiday or playing a lovely old-fashioned board game that are present. Parking is free at the door and of course there is free WIFI. In short, our guests are welcome for a carefree holiday on the sea coast! We really enjoyed staying at the apartment. It met our needs perfectly - we were 3 generations aged between 3 and 62 years. Thank you to the owners for making us feel welcome and comfortable. Great space and lovely town. Thank you so much for your kind review. It was such a pleasure having you as our last guests of our first season! Regards, Jolanda & Marco. The host was really helpful and the flat was clean and well equipped: information about things to do for example and washing machine and iron for example. The location was really peaceful and within convenient distance from all essential stuff. Neighbours are close by and very friendly. Thank you for your kind review. We're happy you had a pleasant stay. Regards, Jolanda en Marco. Off the beaten path, well-furnished, and attentive hosts. Thank you for your kind review. It was a pleasure to have you as our guest. Regards, Jolanda en Marco. Auch die Vermieterin war sehr nett! Wohnung wie auf den Bildern. Tolles Händchen für die Einrichtung. Zentral gelegen. Sehr nette Vermieter. wunderbar entspannt und gemütlich eingerichtet! Wir waren mit zwei Familien vor Ort und haben dank des geräumigen Wohn-/Essbereichs sowie dreier Schlafzimmer eine tolle Woche erlebt. Vielen Dank nochmal und alles Gute für Euch, Jolanda! Vielen Dank für Ihren Aufenthalt in unserem Ferienhaus, es war uns eine Freude, Sie als Gast begrüßen zu dürfen!